Archbishop Vladimir Sokolovsky-Avtomov (1852-1931) of the Russian Orthodox Church was of great help to Prince-Abbot Joseph III at a time when his American mission was under attack from Anglican and Roman Catholic sources. He took the mission under his omophorion and accepted it into the Russian Orthodox Diocese of North America, Aleutian Islands and Alaska, on 9 May 1891. However, the problems that had arisen in the diocese at that time meant that he was promptly reassigned to Russia, leaving that October. This development led to Prince-Abbot Joseph III’s eventual consecration the following year. Bishop Vladimir was a Patron of the Order of the Crown of Thorns. Vasily Grigorievich Sokolovsky-Avtonomov was born in the village of Senkovka in the Poltava Province of Russia on December 31, 1852. His father was a priest in the village. He attended the Poltava Seminary and then advanced on to the Kazan Theological Academy. His studies improved upon his gift for linguistics and music. After graduating from the academy, he was appointed assistant supervisor of the Poltava Ecclesiastical School on July 26, 1878. He was tonsured a monk and given the name Vladimir on September 29, 1878, followed by his ordination to the diaconate on the following October 1, and then to the priesthood on October 3, 1878. Fr. Vladimir led a highly ascetic life, maintaining a strict and sparse vegetarian diet. On January 14, 1879, Fr. Vladimir was assigned as an assistant to Fr. 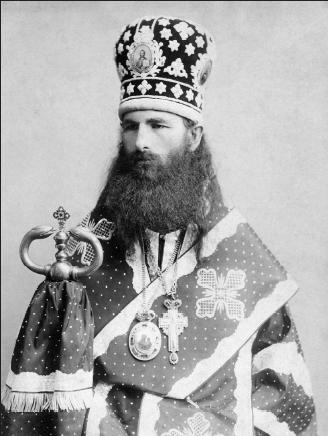 Nicholas Kasatkin, the future St. Nicholas, Enlightener of Japan. With Fr. Vladimir’s proficiency in languages he was assigned as dean of the Russian language school in Tokyo. The language school would become part of the Tokyo Seminary which was to produce many Japanese linguists and scholars. Upon his return to Russia, Fr. Vladimir was raised to the rank of igumen in 1884 and then appointed to the faculty of the Kholm Seminary on June 9, 1886. A year later on August 13, 1887, he was raised to archimandrite and appointed inspector of the Khom Seminary. On December 20, 1887, Fr. Vladimir was consecrated to the episcopacy in St Petersburg, Russia, with his first assignment as the ruling hierarch of the Diocese of the Aleutian Islands and Alaska. Bp. Vladimir arrived in San Francisco in March 1888 accompanied by eighteen students and five co-workers of Bp. Vladimir from the Kholm Seminary, who all were eager to help in the work of the mission. With Bp. Vladimir’s arrival the diocese once again had a ruling hierarch who was resident in North America. The previous ruling bishop, Bp. Nestor (Zakkis), was not replaced after his death at sea in 1882. Using his gift of languages and music, Bp. Vladimir produced musical arrangements for his translations into English of the liturgical texts that the San Francisco cathedral choir sang during the church services. The liturgical services thus attracted many people, resulting in the need for a larger cathedral in San Francisco. As the decade ended, Bp. Vladimir became cognizant of the strains that had developed among the Slavic emigrants who were members of the Unia from the Austro-Hungarian Empire. In late 1890, he met with a group from Minneapolis, Minnesota led by Fr. Alexis Toth, the future St. Alexis of Wilkes-Barre. On March 25, 1891, Fr. Alexis and his parish were received back into the Orthodox Church by Bp. Vladimir, starting the movement that was to continued for several decades. In his search for Orthodox communities to lead back to Orthodoxy Bp. Vladimir traveled widely, crossing the continent three times in his efforts. Bp. Vladimir’s tenure as bishop of the North American diocese was cut short when he was assigned on June 8, 1891 as Bishop of Ostrogozhsk, an auxiliary of the Voronezh Diocese. It was October before he departed from North America for his new position. Later, from December 22, 1896, he was assigned ruling hierarch of the Diocese of Orenburg and the Urals, and from November 26, 1903 he was the ruling bishop of the Diocese of Yekateriniberg and Irbit. Due to illness, Bp. Vladimir was granted retirement on March 18, 1910 from active episcopal duties, but was appointed abbot of the Andronikov Monastery in Moscow. In 1921, Patriarch Tikhon raised Bp. Vladimir to the rank of archbishop and appointed him as the ruling hierarch of Yekaterinoslav (now Dnipropetrovsk, Ukraine). But, the turmoil of the Bolshevik takeover of Russia prevented him from reaching his diocese, and he remained in Moscow. He became associated briefly in 1926 with the Gregorian schism in the Russian Church, but quickly repented and returned to the canonical church. Isolated in Soviet Russia and suffering utter poverty, Abp. Vladimir died on November 27, 1931 and was buried next to the altar of the All Saints Church in the Moscow suburbs where he had been serving. Throughout his career, Abp. Vladimir sought to improve the quality of liturgical singing. In his writing, he concentrated on refuting Roman Catholic teachings and on missionary activities of the Russian church, with emphasis on the mission to Japan. While in America his fame is centered on his cultural refinement and musical accomplishments, Abp. Vladimir is esteemed in Moscow as an ascetic spiritual elder.